Baby Birds - Should I Help? It's important to know what you can do, and what you can't do when you find these out of the nest young birds. Never force water down their throats, most who do this actually drown the bird. The adults do not bring water to the nest. Water comes from the insects or fruit they eat. Please take a moment and listen to Dr. Becker's comments on this issue. Below you'll find helpful links to websites. Many baby birds are thought to be abandoned or out of the nest too soon by many backyard birdwatchers. The truth is, few young birds just fall from their nest unless storms or other natural disasters occur. 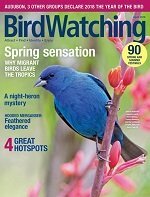 Most birdwatchers who find a young bird automatically want to care and feed the bird. It is strongly recommended that you not do this. You are more likely to do more harm than good. Instead, examine the bird for injuries. If hurt, take it to a local veterinarian or call your local conservation department for the nearest wildlife rehabilitator. 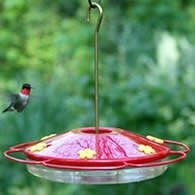 If you find an uninjured young bird you will need to determine whether or not it is really an orphaned bird. The best way is to determine if it is a nestling or a fledgling. 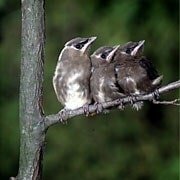 Most young birds that are found are really just young fledglings that can't fly well. Many people don't realize that when birds leave the nest most are unable to fly. Rather they jump and glide to different tree branches. Sometimes missing and ending up on the ground. This is why you want to know if it's a fledgling or not. In order to determine whether the bird is a nestling or a fledgling allow the baby bird to perch on your finger. If it is able to grip your finger firmly than it is a fledgling. The best thing to do in this case is to place it in a nearby tree or shrub and leave it alone. The parents will continue to care and feed it on their own. If the bird is not able to cling to your finger, than it most likely a nestling. If this is the case try to locate the nest. Most of the time it will be close by and well hidden. Place the bird back in the nest. If the nest cannot be found, try lining a small berry basket with tissue and tying the basket to a tree. Place the young bird in the basket and leave it alone. The parents will take care of it once you leave. If cats are a problem, keep them indoors for a couple of days. If it is neighboring cats or predators you fear, try to move the bird out of harms way. Move it to dense shrubbery. Many bird deaths are caused by well-meaning people. 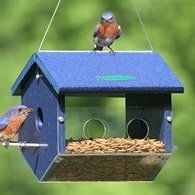 Improper feeding and stress can cause a baby birds death. 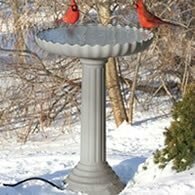 Forcing birds to drink water can also cause drowning and death. Never force water into any bird. Should you hand-feed birds that you have found? The short answer is no. Young birds are fed by their parents about every 20 minutes during daylight hours. Most people are not able to provide this much time and effort in raising young birds. Be Advised - It Is Illegal To Possess Wild Animals Yes, holding wild birds in captivity is illegal. 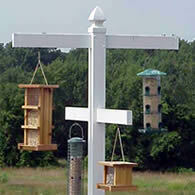 Not only do young birds need to eat every 20 minutes during daylight hours, each bird species diet is different. Some bird species diet will change from the nestling phase to the fledgling phase of their development. Do you know exactly what the bird eats? The question asked is "why do birds that are not able to fly, leave the nest?" To us humans, home is a warm and safe environment. For birds, the nest can be a dangerous place. Predators can attack the whole brood leaving an unsuccessful nesting season. It is in the best interest of the young birds to not only leave the nest quickly, but it helps to be spread out from one another. This aids in limiting the number of baby birds a predator might harm. Giving the young the greatest chance at survival. NEW! Read interesting stories about baby birds from some of our visitors find out what types of experiences they've encountered. While it is understandable why one would want to help young birds, the best thing to do unfortunately, is to leave them alone. If cats are a problem, keep the cats indoors for a couple of days. If it is neighboring cats or predators you fear, try to move the bird out of harms way by placing the bird in dense shrubbery. Without knowing the mental state of the young bird you are unable to know whether you are being a comfort or stressing it to death. Wild animals do not want to be petted. Without the proper license and training, your best bet is to leave wild baby birds alone. Nature as we all know is not always kind. Hope You Enjoy Reading The Stories.